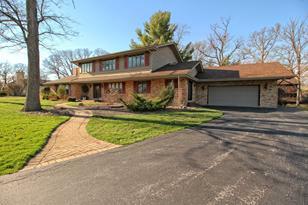 Incredible opportunity to own in beautiful Prestwick! 2 story beauty which is nestled on a mature lot with large trees and gorgeous homes. Open concept floor plan with a family room that has vaulted ceilings and skylights for great all day natural light. Floor to ceiling brick gas fireplace. Updated eat-in kitchen has brand new GE profile appliances, deep copper sink, soft close wood custom cabinetry, granite countertops, and breakfast bar. Large living room makes a great place to entertain with sunken in bar, tray ceiling, sky lights, and doors that lead out to the deck. Also would make a great option for a 1st floor master suite. Upstairs features 3 spacious bedrooms and 2 full bathrooms. Master suite is complete with hardwood floors, vaulted ceiling, walk in closet and a den. Master bath has double vanity, separate shower and soaker tub. Possibility for 4th or 5th bedroom in the finished basement. NEW ROOF 2018. Meticulously cared for. Agent owned interest. 634 Pheasant Trail, Frankfort, IL 60423 (MLS# 10145069) is a Single Family property with 3 bedrooms, 2 full bathrooms and 1 partial bathroom. 634 Pheasant Trail is currently listed for $309,900 and was received on November 28, 2018. Want to learn more about 634 Pheasant Trail? Do you have questions about finding other Single Family real estate for sale in Frankfort? You can browse all Frankfort real estate or contact a Coldwell Banker agent to request more information.